Tokyo. Japan crushed the Netherlands 16-4 at the Tokyo Dome to take their second win in this round, and becomes the first team from this group to advance to the WBC semifinals. Team Samurai’s big bats exploded with 17 hits, of which six are home runs, which tied the record for most homers in a WBC game. The defending WBC champions posted runs in every inning, as the contest was called in the 7th frame according to the mercy rule. An unusual aspect of the day’s long-ball power surge was for Japan’s batting order to complete a rare baseball feat – hitting the cycle for home runs. The six round-trippers included 2 solo homers, a two-run shot, 2 three-run dingers, and a grand slam home run. Against Netherlands starter Rob Cordemans, first batter Takashi Toritani set the stage for Team Samurai with a leadoff solo homer. 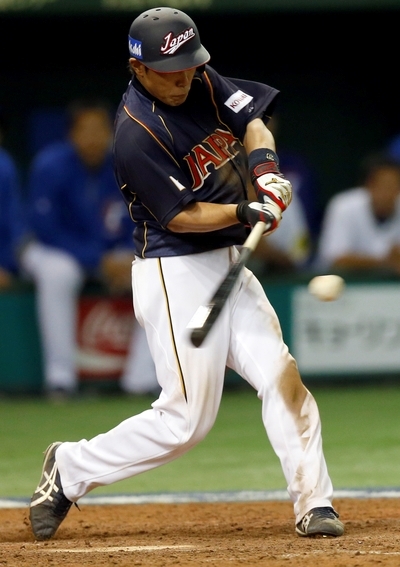 In the second frame with one man on, Nobuhiro Matsuda blasted a two-run shot. Several batters later, with two runners on, Seiichi Uchikawa slammed a three-run homer for Japan to lead by 6-0 after end of 2nd inning. In the next frame, Atsunori Inaba tagged Dutch second pitcher Tom Stuifbergen for a solo homer. Team Samurai’s relentless attack continued in the 4th inning, when with two men on, Yoshio Itoi clobbered a three-run homer to make it 10-0 at that point. Japan added one run each in the next two innings. The Netherlands finally came alive in the bottom of 6th frame to score 4 runs. In that rally, Wladimir Balentien stroked a double with bases loaded to bring all runners home. Then Andruw Jones slapped an RBI-single for Dutch’s fourth run in that inning to make the score at 12-4. In the 7th inning, Team Samurai put the game out of reach when with bases loaded, Hayato Sakamoto ignited the final firework outburst with a grand slam homer for the 16-4 final outcome. Japanese starter Kenta Maeda was the winning pitcher. He tossed five scoreless innings, yielding only one hit and striking out nine batters. Dutch starter Rob Cordemans was charged with the loss, as he gave up 6 runs and was taken out during the second inning. Japan has two victories, and they advance to the WBC semifinals in the US next week. The Netherlands (1-1) will face Cuba (1-1) in the next game tomorrow (March 11), as they compete for the other berth from this group for going to the US.